Rotoform is an economical and reliable granulation system for the production of premium quality pastilles. 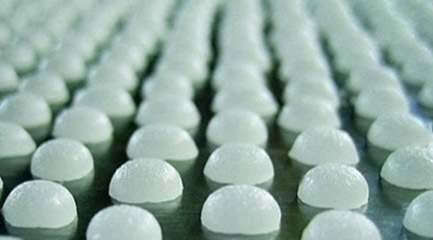 The patented Rotoform pastillator provides dust-free pastilles that are highly uniform, hemispherical, stable, thermally unstressed and of high purity and quality. Rotoform granulation system provides an environmentally-friendly process with low sound emissions, low dust emissions and no need for air cleaning. Furthermore, the closed cooling water system means there is no possibility of cross contamination between water and end product. The initial investment costs of Rotoform granulation systems can be anything up to 60% lower than those of competitive systems, while energy costs are substantially lower too. The inherent simplicity of the Rotoform granulation system also means fewer spare parts and easy cleaning. The fact that several Rotoform solidification lines can be run in parallel offers a high degree of versatility and the ability to handle anything from 100 to more than 2500 tpd. It is also easy to change over to partial operation without stopping production or affecting product quality.